Situated right along the Rio Grande, El Paso has been ranked one of the safest of the large cities in the United States for several years. Visitors to the city appreciate the love of the arts with a huge selection of theaters, ballet, symphony orchestras, and museums. El Paso has a large population with almost 2.7 million people in the area. In a city this big, you might worry about finding a great holistic dentist, but El Paso has an excellent selection of dentists to choose from regardless of the type of care that you require. A frantic search of the city while you are feeling intense pain from a terrible toothache is not an issue when you access our Emergencydentistsusa.com website. Our convenient listing of El Paso holistic dentists provides you with all of the information that you need to make a great decision about your next dental visit. Simply scroll through the listing of holistic dentists provided and click on the dentist with services that suit your needs. You can also find information like office hours, types of services provided, and even payment forms accepted through our simple-to-use website. When you do not have the time to access the Emergencydentistsusa.com website, you can also use our toll free dentist finder to speak with a friendly agent who will be happy to assist you. Our caring agents provide you with all of the information that you need to select a great El Paso holistic dentist and can even set up your first dental appointment for you. Remember to arrive at your dental appointment at least 10 minutes early in order to fill out any necessary paperwork. Bring your dental insurance card, any copay that is required, and your photo identification with you to your first appointment. The sprawling city of El Paso has plenty of holistic dental clinics available to treat your dental emergency or to provide you with routine dental care. Several of the top holistic dental clinics are listed below. 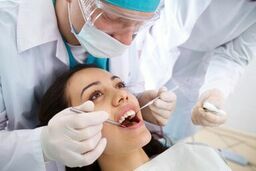 Description: Offering implant dentistry, cosmetic dentistry, and general dentistry, Dr. David Rizk is committed to safe, high-quality dental care. From soft-tissue lasers to an onsite CT, this dental practice utilizes state-of-the-art dental equipment to provide the dental care that you need. A friendly staff and compassionate treatment are what sets Dr. Rizk’s dental clinic apart from the rest. Description: From routine dental procedures to complex restorative care including braces, Green Family Dental provides everything you need in a holistic dental clinic. Friendly office staff are always available to answer your questions and provide you with compassionate care. Green Family Dental is available for emergency dental procedures along with more common procedures like fillings, cleanings, and even implants. Description: With over 20 years of experience in holistic dentistry, Dr. Stein was voted the Best Dentist in El Paso in 2013. With services ranging from restorative dental care to emergency dental services, Dr. Stein’s kind and caring office staff invite patients to experience top-notch dental care with an approach that encompasses healing of the whole person. Choosing to use a holistic dentist for your dental emergency or your routine dental care does not mean that you have to start over in your dental care. A holistic dentist simply helps you to make great choices about your health by using dental materials that are considered safe for both the environment and your body. From replacing amalgam fillings with more natural alternatives to utilizing the latest dental technology to shorten your healing time, holistic dentists are a great choice when you are concerned about your health. When you choose a new holistic dentist in El Paso, it is important to check with the Texas Dental Association to ensure that your dentist is both licensed and credentialed in the state of Texas. You can access the Texas Dental Association website at TDA.org and type in your dentist’s name to see his or her current licensing status and credentials. You can also view a dentist’s licensing and credentials at the office when you visit for your first appointment. Just ask the receptionist to help you with the information.